An act of God (i.e. snowstorm) cost me the opportunity on Friday to meet both Janet Parshall and Michael Medved. Oh, the injustice! I'd like to thank emailer Chuck (and others) for effectively talking me out of most every change I've been making to the site during the past few days. All the galleries and files will be back in place later tonight. So, I'll buy more bandwidth....okay. A revision of today's toon is in the works. A complimentary posting of a cartoon from the current series can be found at Linus from Singapore's Cucumblogs. Nice dragonfish pic! 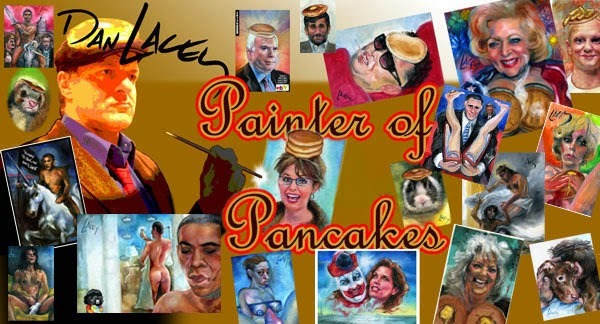 I found your artwork and site through a link on NewsMax. What a great cartoon and message. As a member of the Army, I would like to thank you for both your stand as a Christian and your support of the Military. I go to work every day defending the rights of others and their right to freedom of speech. It is a pleasure to know that there are those like yourself that are taking a stand and expressing the same views and beliefs that I hold dear. I go to work every day to preserve the right of OUR beliefs to be heard and made public as well. ...It is so representative of the fact that those of us in uniform can be Christians, maintain our faith, encourage each other and be Warriors at the same time. There is no conflict, but one aspect brings peace while performing our duties in the other. I'll relocate these comments to the blog this evening. It's our regular vowel movement, a habit of this site which constitutes our Sunday blogging constitutional. Welcome to the right-on-the-mark and north-of-the-border Black Kettle and also to Mary's Hope4America Yahoo group, the latter to which I'm an infrequent contributor but daily peruser. Welcome to our new link partner, the very enjoyable Among Wolves cartoon by Joseph Ward. Joe is another old Comic Sherpa comrade. After you've looked at Joe's site please check out Charles (Top Secret) Stouff's new Carneez toon. Best of luck on the new direction, Charles! A faithmouse cartoon is included in a new Ratherbiased cartoon collection. In response to a quote attributed to John Adams posted on a theophobe site and meant as evidence of Adams' anti-Christian sentiment, and also in honor our Prez's upcoming second Inauguration, I present this page in defense of the true beliefs of our second President. Welcome to three new affiliates today - WhitleyWorld (libertarian) Missouri Conservative and ChristianTeen Network. Faithmouse has been stretched for bandwidth recently due to intense interest, a problem I imagine most cartoonists wouldn't mind having. I've pulled the 'past month' archive located on this site but left the Typepad site (a great gift from Stacy Harp...thanks Stacy!) as it doesn't require bandwidth from faithmouse. So, if you copy any of the images from the Typepad site and post them using your own bandwidth, please remember to also post a return link to faithmouse, which is the only payment I ask for showing my work online. I've also removed a few of the galleries, perhaps only temporarily, just to see what the effect on my numbers are. I've also noticed that the old Comics Sherpa archive has fallen off the edge of the world- I'll try to find time to repost many of these older toons on the Typepad site as well. Also please note that hundreds of the older traditional format cartoons (the 'b' series) which I had collected into sets last year and was giving away for print reproduction have been pulled and are gone forever. Sorry, but I needed more lift in my balloon. A hearty welcome to our new and refreshing Tall Glass of Milk. Our new 'puffing' (my, aren't we wonderful) quote is courtesy of Digital Chirper, who maintains Moe Lauzier's Issues of the Day (check out The Metaphorical Wall by Judge E. F. Harrington while you're there as well, a great primer on the modern fool's gold issue of 'the separation of Church and State'.) Now and then Digi posts a faithmouse cartoon on Mel's site. Thanks, Digi! Positive affirmations are highly appreciated. Thanks for the thoughtful response. I won't go into responding to your points. I think you should just wait to see how the series pans out. You're very welcome, and thank you for your own. :) I do intend to check back with the series as time goes by, and I'm sorry if my assumptions have been very off-base. One of the reasons I believe I've been able to develop and improve the cartoon is that I consider the viewpoint of those who have strong criticisms of it. I think that my cartoon covers a lot of unexplored territory, and I try now and then to take some risks. I appreciate your interest in my work, even though (allow me to make the assumption here) you have a very different viewpoint than mine both theologically and politically. I try to keep the idea as I'm exploring it fluid and open to interpretation, not only for the audience but also for myself. That's because I realize instinctively that ideology can kill an artistic impulse, even though I may very much agree with a certain viewpoint and wish to communicate that to the audience. That's the reason a number of my 'message' cartoons, about subjects I really believe in, haven't made very compelling cartoons. So, your observations are very intriguing and, because I work off of subjects which intrigue mewherever I may find them, I believe your feelings will influence the series. I've noticed your regard for dissenters, to the point that you freely post their comments, and it's part of what made me more eager to email you and see your response. I appreciate your ability to acknowledge criticism, and especially the fact that you might actually let them influence your work on some level. Thank you. I'm not trying to avoid your questions, but that's why I balk at 'debating' the political and theological points of the cartoon, especially while I'm still developing the idea. I'm more than able to defend my muse, but I don't want to drain all the interest out of a particular series before I finish it. I already have a few series I feel pretty guilty about not finishing, because I've already finished them in my head. So, all I can say again is that you've made some very good points.Everything is put back a few days because my crash (you missed a great opportunity to make the joke 'Jesus saves, why didn't you?') so I probably won't pick up the series until Sunday or Monday. However, I am making a few changes to yesterday's (which is again today's) cartoon. Something you may wish to keep in mind is that Ms. Starmole is a fake. She doesn't really believe in anything. I'll try to make a better point of that in the cartoon. I think if you watch the series, you'll see it become pretty dark, and then light again. I know this doesn't answer many of your questions, but I hope it's an improvement upon my frantic and exhausted response of this morning. As something of an amateur writer and poet, I can totally understand the draining of the muse as well as its evolving nature. So I'll end my emails here until the series is done. :) Thank you very much for all your comments and insights into your work, and I look forward to seeing how it pans out. At five A.M. my wife heard me yelling 'No, no, no!' and assumed I was talking to the cat. Actually, I was speaking to the mouse. Jesus saves, but Dan did not. Today's cartoon therefore is a redo of yesterday's cartoon. It's a much better version, trust me. Today's cartoon is the third try at the Religious Liberties' amendment cartoon. I've deleted the previous versions and substituted today's toon for those already hot linked on various sites. The faithmouse cartoon has a new friend at ConservativePosts and a future friend at Idiotopia. A new cartoon will still be posted for later today, although I haven't decided if it should be about lower suicide rates among the religious or tsunamis. A new cartoon is on it's way for this morning. I'd like to thank Mitchell and Judith Hadley of the Twin Cities, who posted a very nice 'thumbs up' for the cartoon on their Our Word and Welcome To It blog. Lime is a bright and positive new link courtesy of Pastor Anne in Norway. The unfailingly loyal Stacy at e-involved has blessed the site with the present of a typepad blog, which I'm incorporating as a new and improved method of displaying recent archived cartoons.